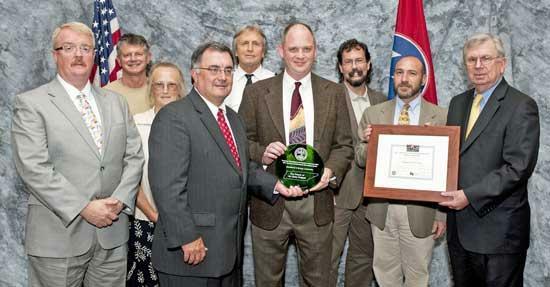 Several representatives from Cannon County were on hand to receive the 2011 Governor’s Environmental Stewardship Award for Energy Leadership, recognizing the county’s Power of Art solar project. In the back row (l-r) are Steve Johnson, owner of Lightwave Solar Electric, LLC; Bruce Clarke, owner of Good Earth Energy, LLC; and Pete Vash, project engineer for Lightwave Solar Electric, LLC. Pictured in the front row (l-r) are Greg Rogers, board president for the Arts Center of Cannon County; Fran Paris, Arts Center of Cannon County board member; TDEC Commissioner Bob Martineau; Donald Fann, director of the Arts Center of Cannon County; Neal Appelbaum, board vice president of the Stones River Watershed Association; and Deputy Governor Claude Ramsey. The Arts Center serves as a cultural center for Cannon County and the five surrounding counties, providing both art and education as a not-for-profit organization. A private investor, Good Earth Energy, leased the center’s roof to prepare for a 29 kilowatt solar installation. After 15 years of operation, the system will be donated to the Arts Center. After the system has been in operation for 16 years, the Arts Center will obtain ownership of the solar array – benefiting directly from reduced energy bills. Good Earth funded an educational kiosk inside the Arts Center, featuring real-time output displayed on monitors for the viewing public. LightWave Solar installed the system and funded a time-lapse video of the installation to be played in the educational kiosk and through various electronic media. Also significant is the solar billboard, which is located on the roof and visible to the 13,000 people that pass the center daily. Additional programming for this cultural center is now possible, including discussion about renewable power, energy conservation and emissions generated through traditional fossil fuel consumption. Solar panels on the Arts Center present another piece of the puzzle - local energy production. Beginning this summer, the Farmers Market of Cannon County is relocating to the Arts Center facility. With an interest in local food production and the culinary arts, this particular audience traditionally has raised awareness about larger sustainability issues.